An open-air market in Houlton, Maine featuring locally-grown-and-produced items, including vegetables, meats, cheese, baked goods, plants, and crafts. The mission of the Houlton Community Market is to provide the local community with high quality products and to offer market members a venue for marketing and selling their goods. Founded in 2009, the Houlton Community Market provides an opportunity for residents and visitors to northern Maine to purchase locally-grown-and-produced items, ranging from veggies, baked goods, and cheese to starter plants, jewelry, and more! 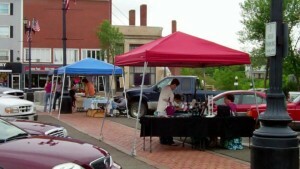 We’re located in downtown Houlton’s Market Square on Saturdays from 9:00am-1:00pm, Memorial Day weekend through October. Come visit, rain or shine….we’ll always greet you with big smiles and a great selection of items for purchase! Houlton Community Market will hold their Annual pre-Thanksgiving market on Saturday, November 18th, 9:00am-1:00pm at 53 Main St.